Beginning in 2010, Essex, Massachusetts shipbuilder Harold Burnham took on the challenge of constructing a wooden sailing vessel using traditional techniques. He cut the trees himself from his woodlot, and milled them himself at his boatyard. Using volunteer labor from hundreds of friends, acquaintances, and community members, and recycled and repurposed materials he constructed, in just under a year, the schooner Ardelle at a cost of less than $20,000. 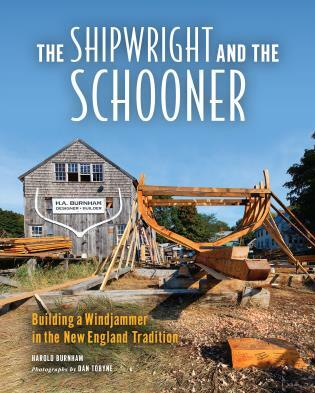 The Shipwriight and the Schooner is an exploration into traditional New England shipbuilding, and it is a journey of discovery for both the author, who has spent his life building wooden boats, and the photographer, who had his first experiences in the boatyard. The book chronicles in words and stunning color photographs the construction, launch, and subsequent season of sailing aboard the Ardelle. The vessel is a testament to community involvement and a badge of honor in the age of mass production. It is a reminder of simpler times, when things were meticulously crafted by hand, and of a lifeway that has mostly vanished. Dan Tobyne, a photographer and native New Englander, has been involved in photography for more than forty years. Early in his career as a teacher of at-risk youth, he helped develop a wilderness educa¬tion program that used photography as a behavior-modification tool. He is an artist member of the Marblehead Arts Association and a member of the Griffin Museum in Winchester, Massachusetts. His work is on display in public and private collections throughout New England and is featured in the books Boston’s Emerald Necklace, Thoreau’s Cape Cod, and Thoreau’s Maine Woods. He lives with his family in South Hamilton, Massachusetts. Harold Burnham bears a family name that is virtually synonymous with Essex, MA, the birthplace of approximately 4,000 schooners. He is the 28th Burnham to operate a shipyard in Essex since 1819. Growing up in a family of shipbuilders and a town where shipbuilding is a tradition handed down over the generations, Harold has learned the standards of the past and traditional techniques. Harold Burnham has carved out a place in history as a master boat designer, shipwright and sailmaker. Like his ancestors before him, Harold has a holistic approach to vessel design, construction and operation which makes him uniquely efficient. In addition to holding a bachelor’s degree in maritime transportation and fisheries from the Massachusetts Maritime Academy, he draws upon extensive experience at sea, and of course, techniques learned in the famous shipyards of Essex.